50.5 and 49.5% respectively.It is an excellent example of Russian and Indian collaboration in defence and extraordinary success of BrahMos is a reflection of Indian and Russian friendship.Russia is a most important friend of India after the soviet and its collapse.BrahMos has an official range of only 290km because of mtcr treaty of Russia. 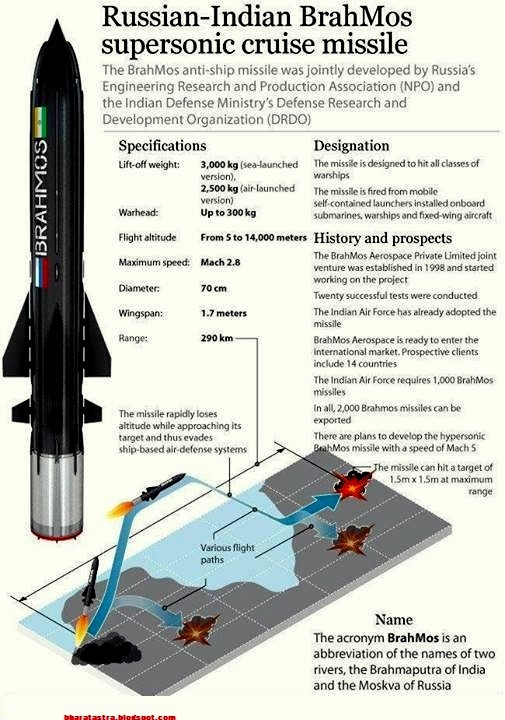 BrahMos is world's only supersonic cruise missile in the service with the armed forces.It is based on the deadly P800 onix cruise missile with the considerable upgrade.Solid stage booster and liquid ramjet engine powers the missile for a sustained supersonic flight throughout the whole path.solid state booster provides BrahMos initial acceleration for lift off at fly the missile to enough altitude and velocity so that its ramjet engine gets start.After solid stage burnout, it gets detached from the BrahMos and afterwards BrahMos is powered by its powerful air breathing ramjet engine.Ramjet engines uses ram of air for its combustion and thus does not require internal oxidizer and also it is more efficient than conventional rocket engine thus provide a greater range and reliability.BrahMos has a 300 kg of a high explosive warhead for the antiship variant.BrahMos has many variants with active service in the Indian navy and Indian army.Indian army has block 1, block 2 and block 3 with supersonic dive capability is in service. 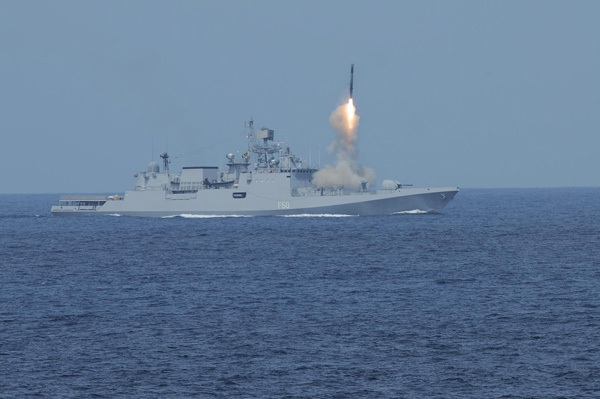 An anti-ship version of BrahMos missile is already in service with the Indian navy. 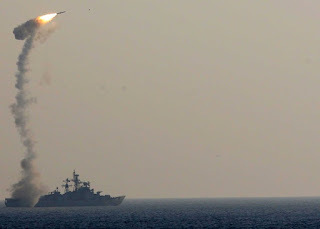 there is two type of launcher of Brahmos missile on Indian navy ships, enclined launcher on ins Rajput class ships and vertical launching system on the rest of the warships.Installation of the brahmosh missile on the Indian navy warships makes them most fearsome antiship weapon system of the intire world.there is no missile with the capability to match speed, range and accuracy and reliability.None of the existing warships anti-missile defence systems can counter the BrahMos missile.Brahmos 3mach speed and sea skimming give the very little amount of time to counter it and CIWS are almost obsolete against it.Countering of Brahmos becomes almost impossible thanks to its supersonic manoeuvres around its target.There is some hope with its countering by using AWEC aircraft and detect it early and try to intercept using long-range anti-missile weapons like SM2. 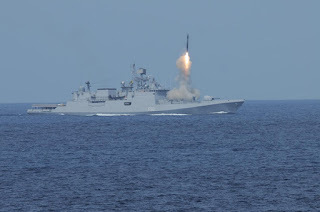 BrahMos' anti-ship variant has a range of 290km in the high low profile of flight and around 125 km in the full sea-skimming flight profile.BrahMos' anti-ship variant only differ from its ground attack in terms of the terminal seeker.This version uses active radar homing to identify and destroy the target in terminal phase.mid course correction is provided by GPS, GLONASS.Recently RCI imirat a lab of DRDO has developed G3OM system which introduces a new guiding system by utilising GPS, GLONAS and GAGAN data.this system is designed to be completely produced as a chip also called as a system on a chip.